We’ve survived Thanksgiving and Black Friday, but the month of December also presents some challenges as malls, office buildings and industrial factories are affected by weird holiday schedules. You’ve likely got your holiday scheduling routine down, but we’ve been working through the easyioSchedule kit and found some Objects that may be especially helpful during this time of year. So, we thought we’d share them with you. As of the writing of this blog, there are three objects in easyioSchedule: HolidayCalendar, NumericSchedule and generic Schedule. As mentioned, we’ll take a look at the Schedule and HolidayCalendar objects now. FYI: We’re using WorkPlace AX 3.7 connected to an FG32 for this sample. 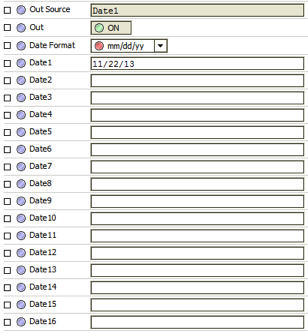 The Schedule object allows for two events per day and two holiday overrides. The Holiday input is meant to work via a link from the HolidayCalendar object, which we’ll discuss in a moment. The configuration of a Holiday is similar to the daily configuration, but with the output type added. For instance, if we simply wanted to do an “Off” event for the holiday, we’d leave the Event Output as OFF and not worry about the time. If we want to override the day with special holiday event hours, I would add those hours directly in this window. We are given the option of two time events. The Event Output override value will be restricted to those hours which you’ve configured. 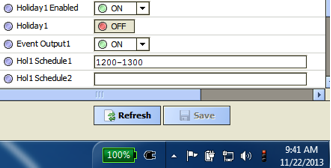 For example, in the figure below, when Holiday n Enabled is ON, the Event Output n will transfer to the Schedule’s Out slot only between noon and 1pm. This object allows for configuration of up to 16 holidays. You’ll want to use this in addition to the Schedule Object to create more specific schedules. As seen in the figure above, I’ve configured one. On this day, the output of the object will go active, or “ON”. The linked Holiday object is active – or ON – overriding our daily scheduled hours and my Schedule object then gives and Out value of OFF even though it is currently within scheduled occupied hours. With that, you’ll be able to eat, drink and be merry with ease this holiday season. Should scheduling questions come up, you can always contact our support team, day or night.